Is it time to upgrade your garage door opener? If you’ve been struggling with your existing system, it may be time for garage door opener repairs or replacement. Problems that may necessitate garage door opener replacement or repairs can include loud garage door opener motors, openers that don’t function at all and openers that work intermittently. While you can often turn off your garage door opener and open and close your garage door manually, it’s inconvenient, to say the least. You also didn’t buy a garage door opener just to manually open your door every time you want to go in and out of your garage. However, even if your current garage door opener is in working order, you may want to consider upgrading. Advancements in modern garage door opener technology are nothing short of amazing. The 8550W Elite Series® Wi-Fi enabled garage door opener from LiftMaster comes complete with MyQ® technology, which is a system that allows you to have total control over your garage door, no matter where you are. It’s a wireless system you can use to open your garage door when you get home, and you can also open it from your office or elsewhere if you have a guest or family member arrive and you need to let them in. Did you forget to close your garage door before you left the house? No problem. With this system, you can close your door from the highway when you realize you left it open, too. It’s the ultimate remote control. Furthermore, the MyQ® system alerts you whenever the door opens or closes. This creates a level of security when it comes to your garage door. If the door opens, no matter where you are, as long as you have your enabled device close at hand, you’ll find out instantly. Ole and Lena’s garage door professionals are experienced installers of new garage door openers. Due to the ease of use in controlling your garage door from your smartphone, we recommend the LiftMaster Elite Series® 8550W. Not only does this garage door opener include Wi-Fi® and MyQ® technology, it also uses Security+ 2.0®, a program that sends a new code to the garage door opener with every click to make sure the door doesn’t open by accident. This opener includes battery backup as well, so even if the power goes out, your garage door will still open and close, and you can set your door alerts to come to your phone by text or e-mail. The MyQ® app is a simple, free app you can download to your phone and link to your garage door opener in moments. You also get the Timer-to-Close feature, which automatically closes the garage door after a pre-determined amount of time if it is left open, for added security. 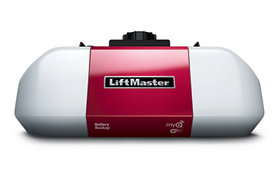 Ole and Lena’s Door Company would love to provide you with a quiet, compact, smooth-operating, smart garage door opener from LiftMaster right away. Whether your current garage door opener is old and needing repair or is just ready for an upgrade, we know one a LiftMaster garage door opener will suit your needs. If you thought having a remote garage door opener was a vast improvement over having to open and close your garage door manually, you’ll be amazed at what a difference a Wi-Fi-enabled smart garage door opener with MyQ® technology makes. To find out how to have Ole and Lena’s professional installers put in your new garage door opener as soon as possible, contact us online today.